Today, I am pleased to share an expanded version of my first review for Red Letters Reads, an online book review site, founded by Jessica of Don’t Mind the Mess. 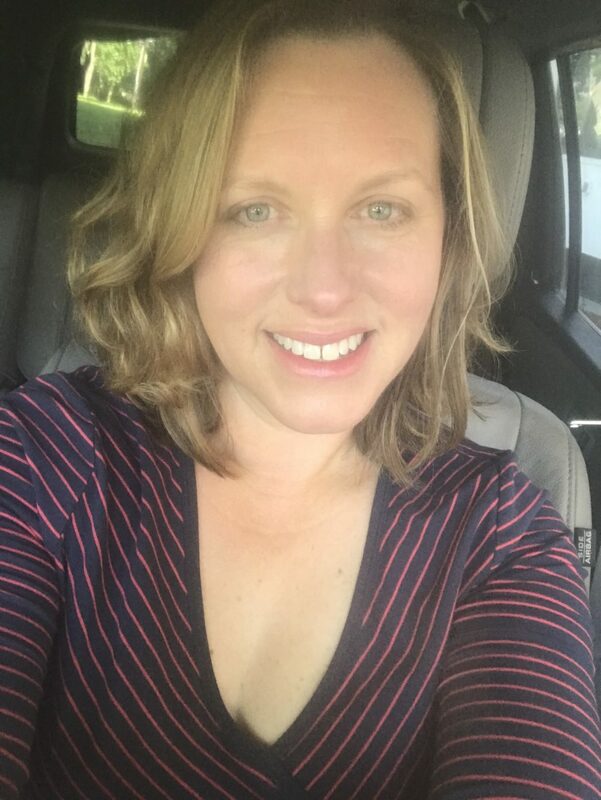 I met Jessica a few months ago at a Boston Parent Bloggers event. Soon thereafter, she solicited volunteers to read and review The Sandcastle Girls (see my review here), and as an avid reader, I was thrilled to review an advance copy of that book. When she then founded Red Letter Reads, I jumped at the chance to be a member, and I look forward to sharing reviews of the books I read through that group here. The reviews I share on Red Shuttersmay be longer, and perhaps more personal, than what runs on Red Letter Reads, though I encourage you to check out the site. It’s a terrific resource, if you are looking for a book and just don’t know where to start. Each book will be reviewed by five people, which will ensure a diversity of perspectives. Even the tag line will draw you in: “helping books and readers find true love.” Great, isn’t it? Read on for today’s review. 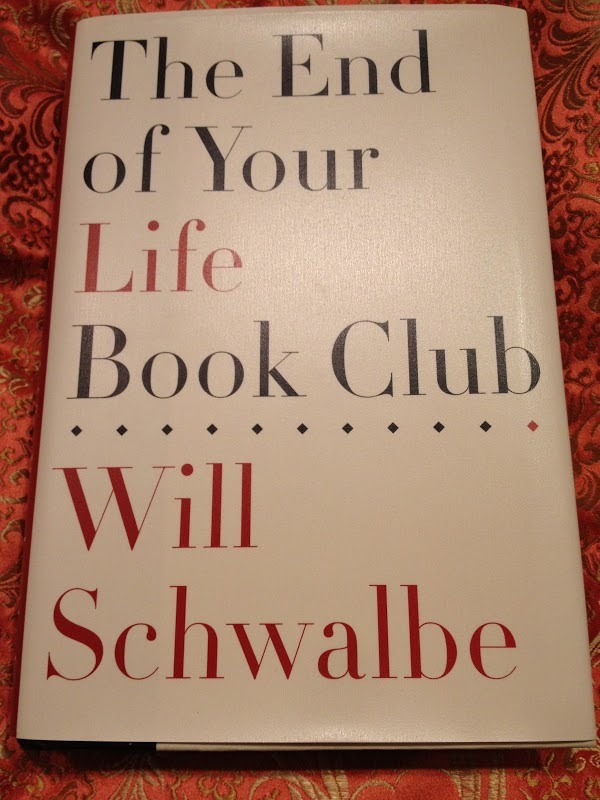 The End of Your Life Book Club by Will Schwalbe explores this question and others about religion, happiness, loneliness, strength, family, and a host of other essential issues we encounter in life. It is through the act of reading—of immersing ourselves in stories, both fictional and true—that we understand who we are and we connect to the world at large. 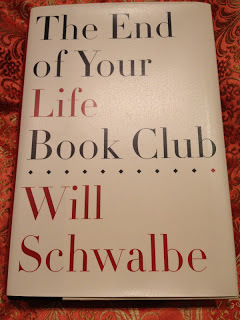 This is the legacy that Schwalbe’s mother, Mary Anne, the other member of this very special book club, leaves him. Together, Schwalbe and Mary Anne read dozens of books together in the last two years of Mary Anne’s life, as she suffered from a terminal illness. By writing this memoir about the books they read and the discussions they shared about their readings, Schwalbe captures the lessons his mother tried to impart as she faced her final days, and he honors her inspiring spirit. Schwalbe’s exploration of how adult children—especially sons—express love and gratitude to their parents is touching. He also does a great job addressing the leaps we take to pursue our passions by recounting his own decision to quit his job and undertake new professional endeavors. Both his personal and professional journeys are, of course, reflected in the books he and his mother read and resonate with the readers of this memoir. One of my favorite sections of the book addresses mindfulness, a quality that is short supply in our hectic lives. From checking email “incessantly” to interrupting an important conversation to answer the phone to fixating on “temporary concerns or desires” rather than thinking a thought all the way through, we lose sight of what is truly important. And, Schwalbe, through this book and during his mother’s final months, worked hard to ensure the precious and impermanent moments did not evaporate. He captured them for himself, his family, his mother, and the reader—a gift to us all, and a reminder of that which we cannot let disappear. I enjoyed this book; it’s a perfect balance of book report and personal history. I felt, in a way, that I had read many books by the end, not just Schwalbe’s memoir, and that is a testament to his ability to capture the essence of the varied books he and his mother selected and why each mattered to their last days together. I’ll admit, though, that it took me a lot longer to finish this book than I had expected. I think it’s because I knew how it would end; Mary Anne’s death is inevitable. In fact, in many ways, it was just like how she always read the end of the book first. That was Mary Anne’s strategy to head off any anxiety or suspense from an intense book; she’d read the last pages first. For me, the reader who never reads the end of the book first, knowing that Schwalbe and his family were going to lose Mary Anne, a woman of great courage and morality who devoted her life to refugees and to helping others, was difficult. It was too close to home, perhaps. If you are facing the terminal illness of a loved one, I would recommend waiting on this book, as Mary Anne’s treatment is a major story line. This is, however, a great selection for people who enjoy learning about new books—I added several books to my own reading list after finishing The End of Your Life Book Club—and people who like memoirs.